The Plosky Tolbachnik volcano has erupted for the first time since the 1970s in Russia’s Far Eastern Kamchatka Peninsula. Activity continues to be elevated. Last night, the eastern lava over flow was weakly active at the outer flank of the NE cone. Strong glow over the summit, despite partially dense cloud cover, indicates that the magma column inside is high and ready to produce more lava flows. Etna volcano: Weak strombolian activity and a small intra-crater lava flow inside Bocca Nuova’s eastern pit could be seen on a webcam image this night. Tremor remains elevated. 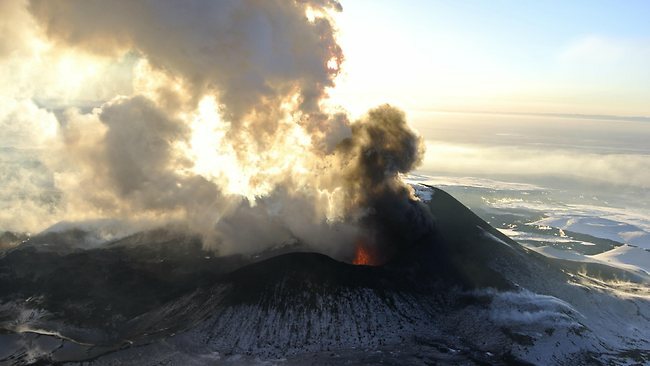 Plosky Tolbachik volcano in Kamchatka continues to erupt fluid lava flows with no signs of the eruption ending soon. Slow effusive activity and a thermal anomaly visible on satellite images continue also at nearby Bezymianny although Tolbachik’s seismic signal obscures the one from Bezymianny. Weak intermittent explosive activity continues at Karymsky (Kamchatka). Kliuchevskoi (Kamchatka) continues to have strombolian activity in its summit crater. Shiveluch (Kamchatka): effusive and explosive activity from the growing dome continue at moderate levels. This view of the flare on Jan. 11, 2013, was recorded by NASA’s Solar Dynamics Observatory. The surface of the sun erupted in a solar flare early today (Jan. 11), unleashing a blast of super-heated plasma into space. A huge sunspot known as AR1654 produced the M1-class flare at 4:11 a.m. EST (0911 GMT), officials with NASA’s Solar Dynamics Observatory said in a description of the event. The SDO spacecraft is one of several sun-watching space telescopes keeping tabs on solar flares and other sun weather events. According to Spaceweather.com, sunspot AR1654 is growing more active and is now “crackling with M-class solar flares” like the one that erupted today. (NaturalNews) An ongoing study out of Germany comparing disease rates among vaccinated and unvaccinated children points to a pretty clear disparity between the two groups as far as illness rates are concerned. As reported by the group Health Freedom Alliance, children who have been vaccinated according to official government schedules are up to five times more likely to contract a preventable disease than children who developed their own immune systems naturally without vaccines.